Well, blow me down! I actually made a dish with the word "light" in the title. And, I liked it!﻿ I do enjoy oil-based potato salad and cole slaw. They're always so light and refreshing. Plus, at potlucks, they're just a safer bet than a mayonnaise-based dish. 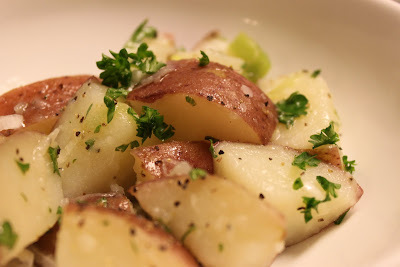 This potato salad was tangy with the lemon juice and mustard. My husband and I both enjoyed it. If it seems a little too tangy to you at first, don't worry. The flavors will mellow as it chills in the refrigerator. In a large saucepan, cover potato wedges with cold water; add one teaspoon salt. Bring to a boil over medium-high heat. Cook until just barely tender, about 10 minutes, checking frequently to avoid overcooking. Drain potatoes; rinse lightly with cool water and let stand for 5 minutes. Potatoes should still be warm. While potatoes are cooling, combine oil, lemon juice, mustard, remaining salt and pepper in a large bowl. Whisk together until creamy and emulsified. 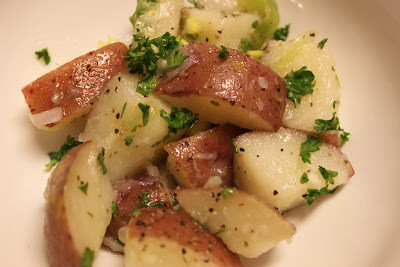 Add the warm potatoes, green onions and parsley to dressing; toss to coat. Serve at room temperature or cover and chill until serving time. Serves 6. I love light potato salads like this. I did one last week that was Julia Child's and it's so easy and flavorful. Love mayo based, too, but these types I can make more often. I will try this one next time.